The three-day CBR Congress held on September 30 to October 2 of this year was very much anticipated on my part -- first because of the opportunities it brings in renewing and establishing networks with other advocates and volunteers working with the disability sector; and second, it is the best venue to fully comprehend what Community Based Rehabilitation is all about. On Day 1, we heard Ms Carmen Zubiaga, the acting Executive Director of the National Council on Disability Affairs, welcoming the more than 300 participants from all over the country to the Second Philippine CBR Congress, whose theme is “CBR: Key to inclusive development in communities”. Proclamation 688 declared the Philippine Decade of Making Rights Real for PWDs – and the NCDA has led the formulation of the Decade Plan of Action in coordination with the national government agencies, the NGOs, and the DPOs. The speakers emphasized the importance of CBR, which is also one of our legislative agenda in ASP. Clearly CBR is the practical strategy towards empowerment and inclusive development, where all people and every member of the community is respectful of the rights of our PWDs. According to the World Health Organization, community-based rehabilitation (CBR) focuses on enhancing the quality of life for people with disabilities and their families; meeting basic needs; and ensuring inclusion and participation. It is a multi-sectoral strategy that empowers persons with disabilities to access and benefit from education, employment, health and social services. CBR is implemented through the combined efforts of people with disabilities, their families and communities, and relevant government and non-government health, education, vocational, social and other services. From the keynote message of the Undersecretary of DSWD Ms. Patricia Paraji: the bottomline is to guarantee equitability; the rights of one apply to all, opportunities given to one is enjoyed by all. CBR is inclusive development and while numerous challenges lay ahead, we must work together to ensure inclusivity, where everyone is accepted. Each one has a role to play and a hand to make it work. The CBR Framework is a life changing structure for the growth and development of every member of the community and we must all contribute to its development. The World Disability Report states that people with disabilities are marginalized in many aspects of societies. They have generally poorer health, lower education achievement, fewer economic opportunities and higher rates of poverty than people without disability. They are more likely to experience greater social isolation and decreased participation in community life. They must overcome greater barriers to access services in low income countries. The global situation now is that 15% of the world population experience disability which is approximately 1 in 7 people. An empowered sector is the foundation of any CBR program. It is implemented through combined efforts of PWDs, their families, their communities, the different organizations and relevant government agencies on health, education, social and livelihood services. CBR as a strategy must be focused in enhancing the quality of life of PWDs and their families; it is about meeting the basic needs and ensuring inclusion in local communities and improving access to services. With CBR, the PWDs and their family members are leaders in decision making processes. This brings about change in culture and practices, removing the stigma and prejudices that would lead to a deeper understanding of how disability can affect human lives. If it does not empower, it is not CBR. 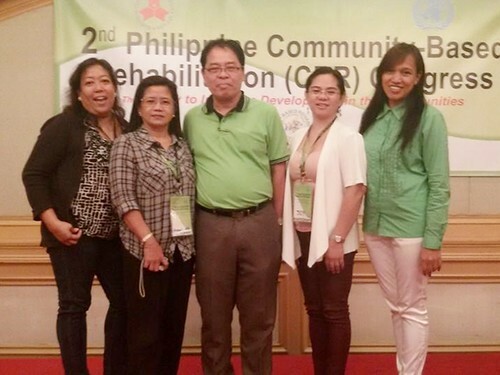 The last day of the congress was for the election and formation of the CBR Network AdHoc Committee – 13 members for the Interim Board who will work for the immediate future direction of the Philippine Community Based Disability Inclusive Development Network. Coming from the different DPOs and organizations to represent the different regions of our country, one of our very own – Ms Marivic Ramos of ASP Laguna Chapter was elected Board Member as the parent representative of Luzon; the other parent being Ms. Marjorie Gimeno of Parent Mobilization Action Group (PMAG) for the Visayas / Mindanao area. The decade for the rights-based, barrier-free, inclusive society started in 2013 will end on 2022 - and the ASP has always been in the forefront and steadfast in advocating for the basic principle of equality for the autism community….. as the song goes – We are on the right track. About the contributor. Dr. Anawi A. Tolentino is the Chapter President of ASP Hagonoy, a practicing physician in the field of internal medicine and a hands on Mom to her 18-year old son – Jandell. She is also the administrator of the Supportive Parents of Hagonoy Children with Disability (SPHC) Center whose programs are centered on parent empowerment and providing learning opportunities for CWD.